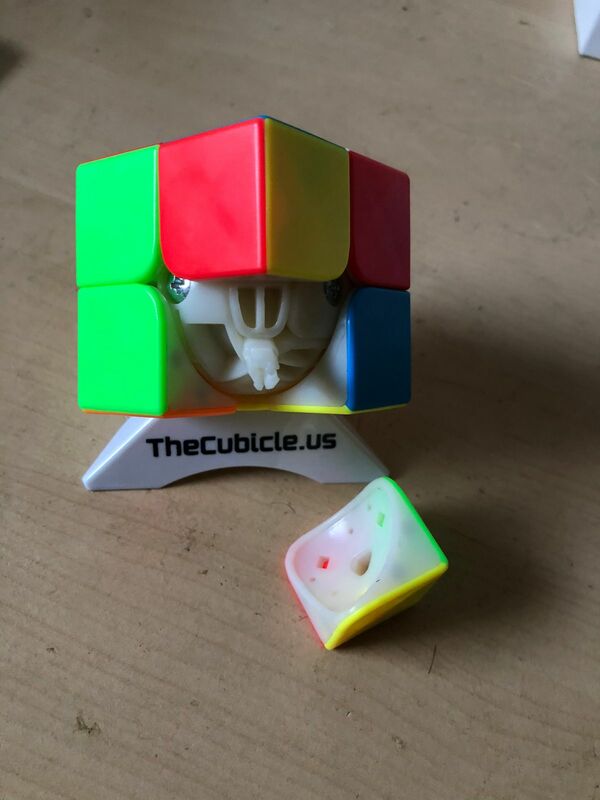 The Cubicle Labs MF2 M is magnetic 2x2 is professionally lubed and magnetized to greatly enhance its capabilities as a speedcube. Forty-eight neodymium magnets are inserted into strategic points in the cube, allowing for consistent magnetic attraction regardless of piece orientation and position. This magnetisation creates a tactile and compliant feel, a clean, clicky feedback and top notch alignment and stability. The magnets add approximately 8 grams of weight to the cube. As I opened up the parcel, realised one corner of the cube had come apart. Clipped corner back on but each time the cube is used, that same corner comes apart from the cube. I had emailed to explain my great disappointment but never heard back. Not happy!!! The cube out of the box was slow but after breaking in it started to speed up. The feeling is smooth and stable and is great for beginner and advanced solvers.